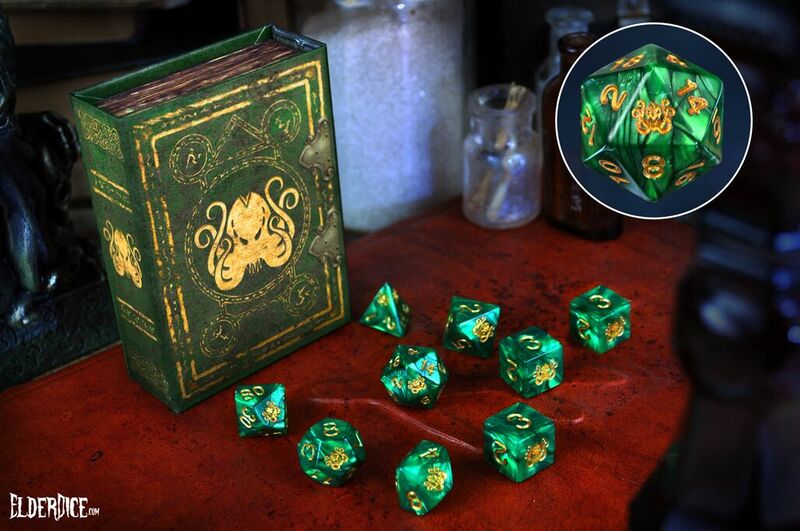 One Last Chance to get the Doom Edition Brand of Cthulhu Dice Set! 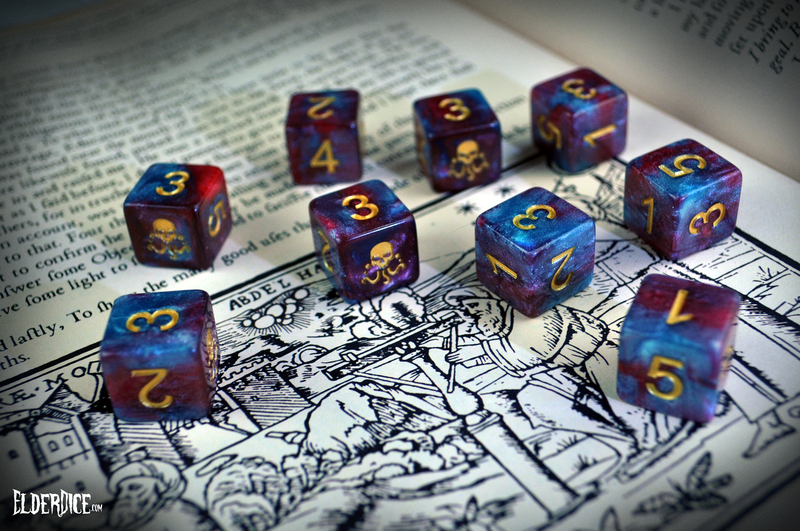 Did you miss the Elder Dice: The Colors Out of Space Kickstarter? Late pledges will open soon for a very limited amount of time. 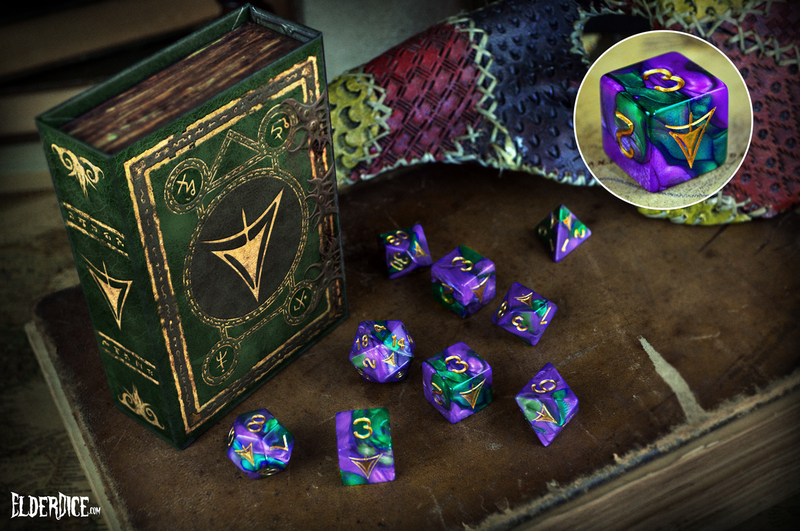 This will be the last chance to get the Kickstarter exclusive items, including the Doom Edition Brand of Cthulhu dice. 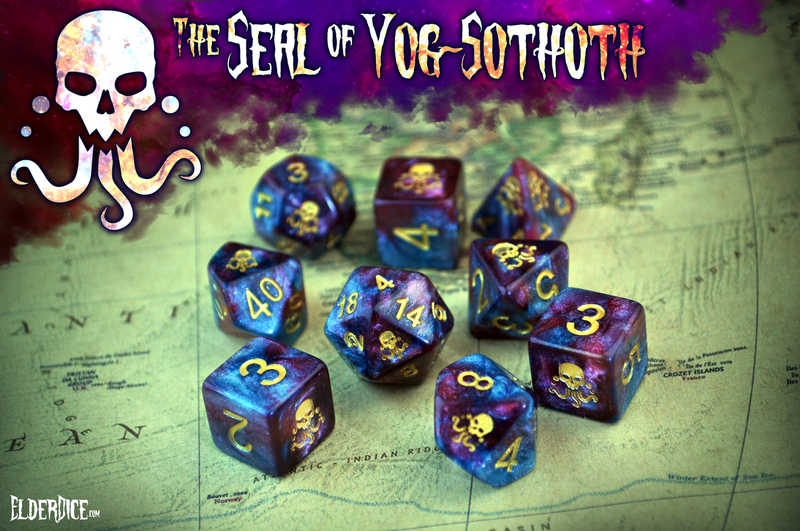 Sign up below to be instantly entered to win three sets of polyhedral Elder Dice (a $47 Kickstarter value), plus, learn how you win your part of more then $660 worth of dice and other accessories we are giving away! Sign up below to win and know as soon as the late pledge system goes live. 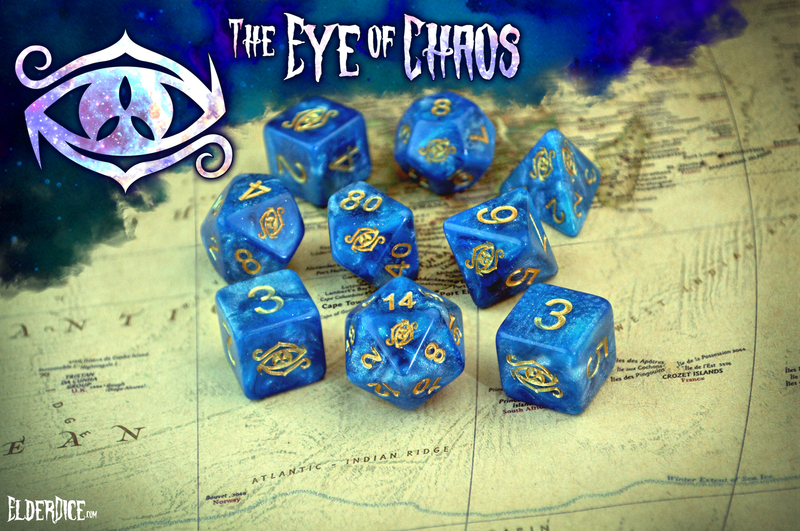 The Eye of Chaos, also called the Three-Lobed Eye of Nyarlathotep, is a symbol of disarray, primordial havoc, and tumult. 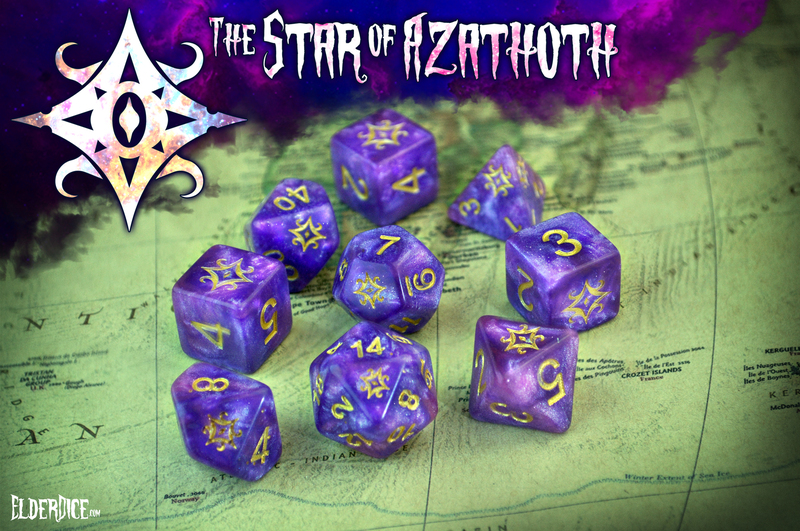 The Star of Azathoth features curving lines that are symbolic of the black spiral vortices of the ultimate chaotic void. Librarians have found this seal stamped in the margins of many books and scrolls near particularly occult passages. Plus All These Sets Will Be Available! Placing a late pledge will be the last chance to get all these dice sets for the discounted Kickstarter pledge amount. The Brand of Cthulhu in "Drowned Green"
Many people have asked for it, and we are brining it to you! 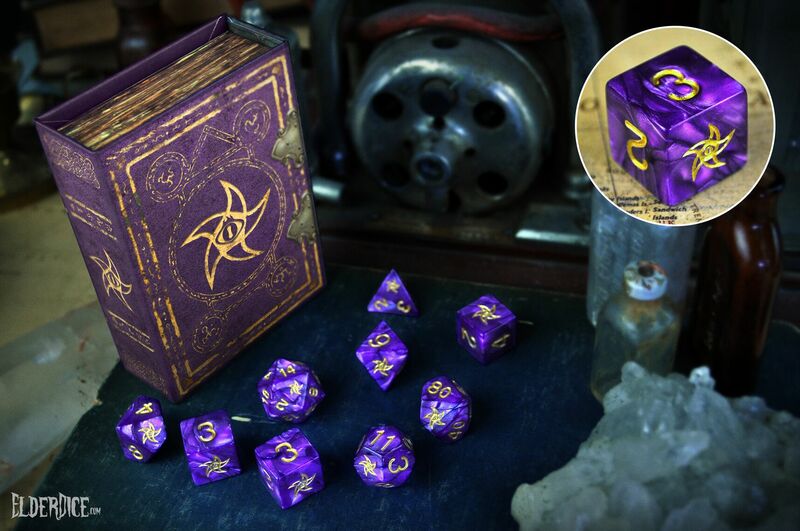 The Astral Elder Sign in "Mystic Purple"
One of our most popular symbols in a most popular color. The followers of the Yellow King prowl the streets of New Orleans in masked disguises. 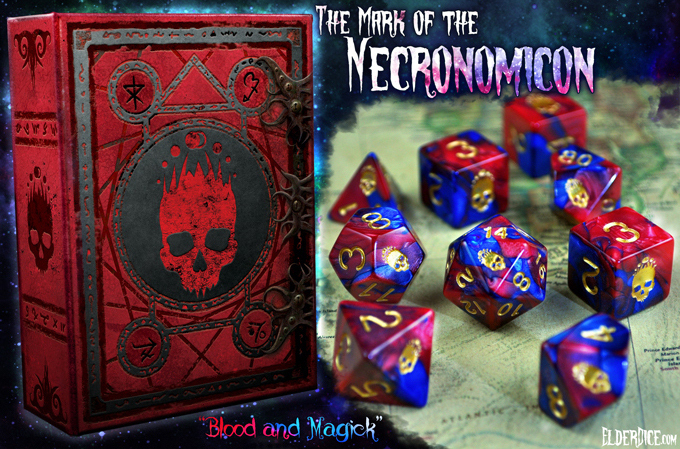 The Mark of the Necronomicon in "Blood and Magic"
Bring the Harbinger of the Dark Star to your tabletop! Ward away evil with this classic symbol in a very popular color. 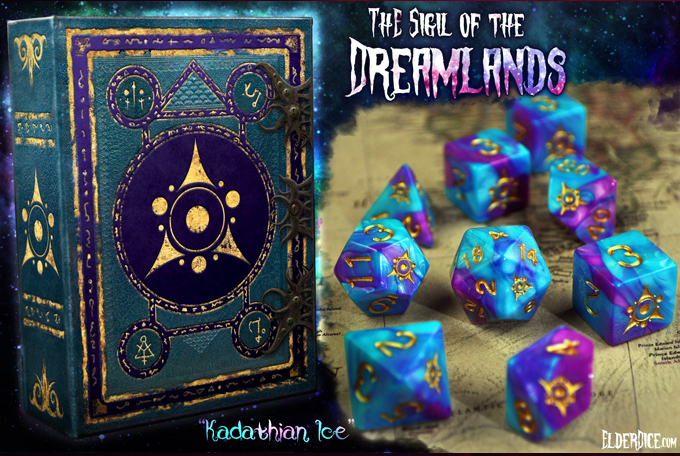 The Sigil of the Dreamlands in "Kadathian Ice"
Explore the Dreamscape and all the lands beyond. 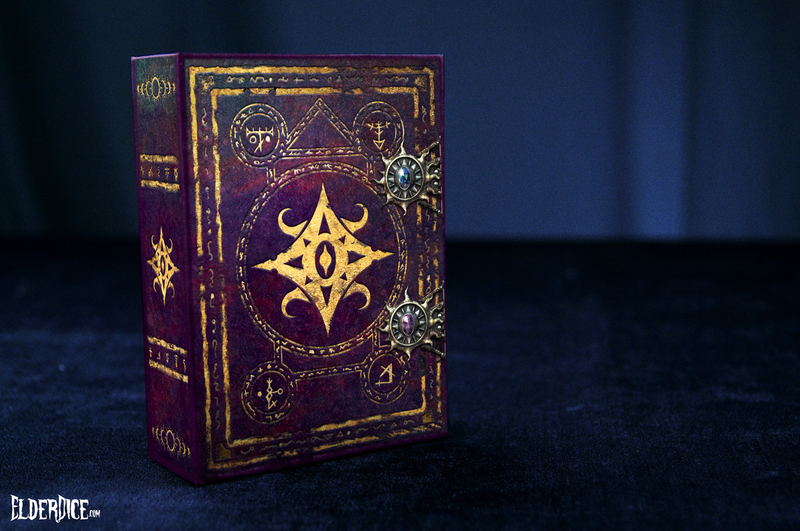 Each polyhedral set will come in its own madness inducing grimoire. It is the perfect way to transport your Elder Dice and add atmosphere to the gaming table. 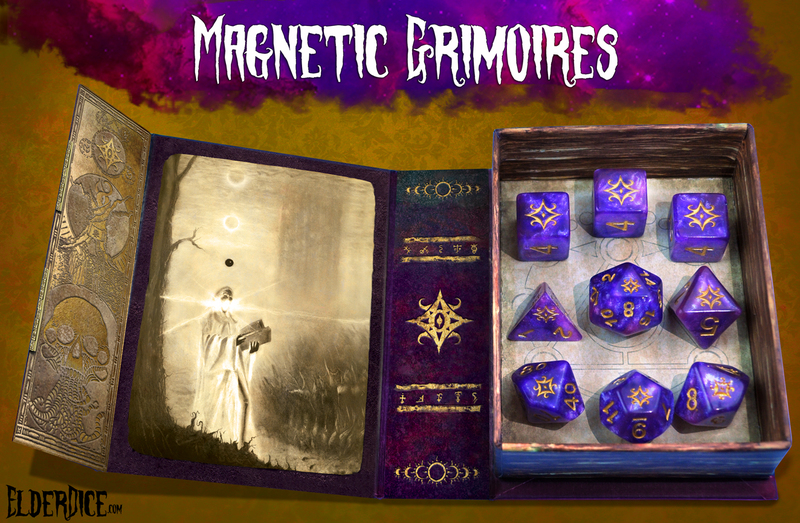 The Elder Dice grimoires will look great on your gaming table, on your shelf, or even on your desk. Each grimoire snaps closed with a magnetic clasp to keep your dice secure. They feature original Lovecraftian art in the interior. 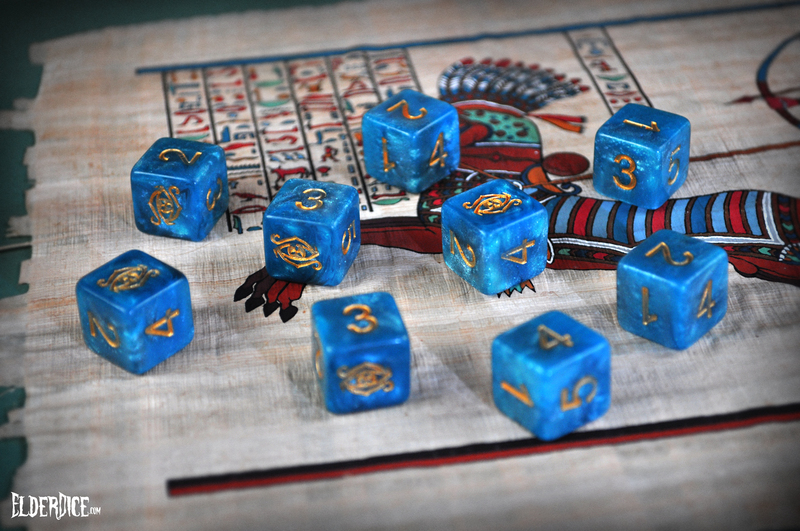 Elder Dice are designed to look both beautiful and horrific. Need to Roll d6s or d10s by the Fistful? Six-sided and ten-sided Elder Dice will be available in standalone tubes. 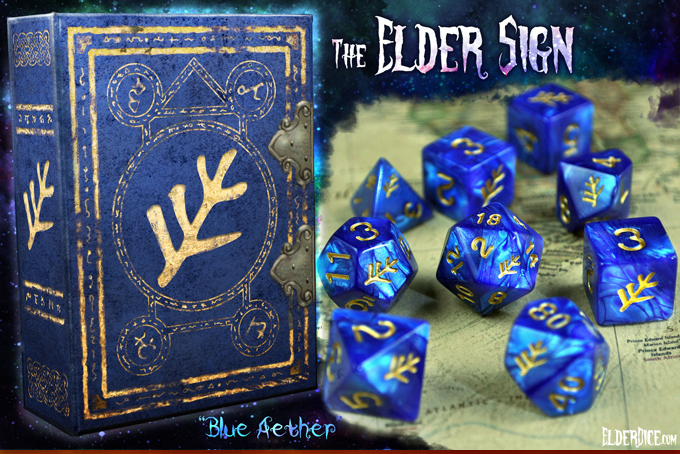 They will also be available as part of Elder Dice Collector's sets. Whether you are playing board games, wargames, or need to throw a massive fireball in your RPG, the magic of Elder Dice will be with you. late pledge system goes live. Plus, you will be entered to win three boxes of polyhedral Elder Dice of your choice. Do not miss out. 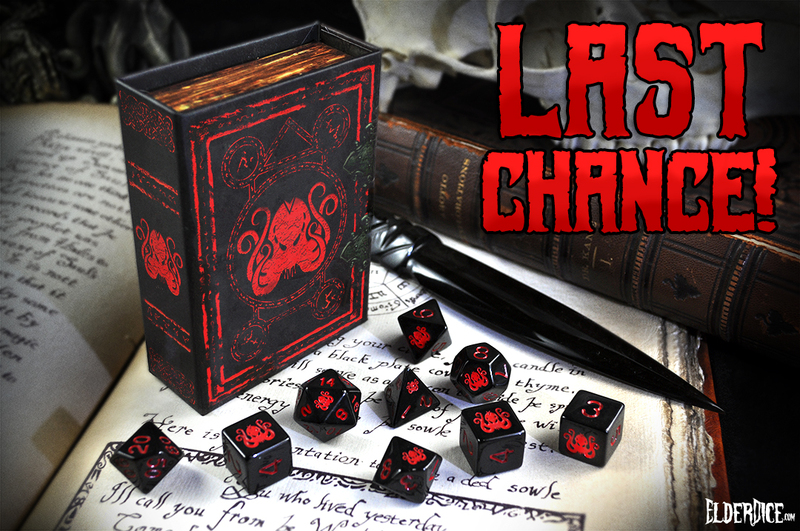 This will be the last chance to get the black and red Doom Edition Brand of Cthulhu dice!